Pc-to-mobile-sms2 Hi NET SOLUTIONS help and guide our customer that how they can improve their sale by marketing their products and services through the latest marketing trends like SMS Marketing on a very competitive and attractive price.Reach out to your customer base by way of bulk SMS to promote your product, Bulk SMS is simply the fastest, instant and most cost-efficient way to reach the masses. We can help you market your brand, product or event thru Bulk SMS Marketing.. 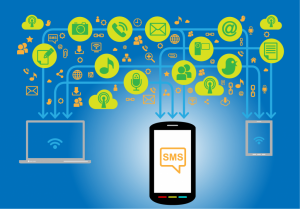 The benefits of SMS text message marketing spreads high and wide for every business. These days, when a mobile phone is more than just an accessory or a status symbol, it is becoming more and more a necessity to daily living. Mobile devices are not just used to communicate to loved ones or business colleagues. It is more than just a tool for emergency situations or a way to reconnect with friends. You will find a lot of people nowadays using their mobile phones to store and receive information, a means to access the internet and even to take photos or to record their daily schedules. Establishing a brand takes more than a single launch or introduction of the product. You need to be able to instil it in the minds and hearts of every individual who might potentially be interested in your products and services. The benefits of SMS text message marketing is that it establishes brand recall and retention without blatant agenda pushing. Eventually, this will lead to an increase in your sales and help you hit or even exceed your target revenue. Majority of your revenue may probably come from existing clients. But what happens with the untapped market? There is fantastic potential in reaching out to a new batch of would-be customers. Also, if you start using the benefits of SMS text message marketing in your business, this encourages referrals from existing customers. With a single click of a mouse or a button, you can already send messages to a multitude of people simultaneously. When people answer to your text message, there’s a huge chance that they are already interested in buying your products. It is certainly a fantastic way to sift through a fantastic number of people and determine those whom you should really focus on. Text messaging is not limited to only one use. You could send a message to inform, remind or promote. You can also give special offers which will encourage interest in your products and services. It is also a fantastic way to launch an event or a new product without spending too much on printing flyers and brochures to invite people.